Monogrammed damask lunch tote bag. Still ongoing for this year, damask, a popular feminine pattern for your lunch time break. Choose this turquoise and white damask design. 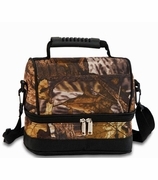 Wide side to side zipper opening with thermal lining allows for food to be kept warm or cool. Two outside velcro pockets for easy access to mobile phone, ID or key. 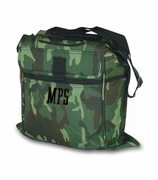 Monogrammed damask lunch tote bag measures 11"W x 8"H x 5 " across bottom. Hand carry. 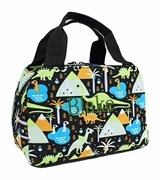 I purchased this lunch tote for my daughter. It is the perfect size and seems to be very good quality. Would recommend!! !